By Dr. Ajit Desai , Dr. C. K. Ponde , Dr. G. R. Kane , Dr. Vivek Mehan , Dr. Rajesh Rajani and Dr. Chetan P. Shah. Dr. C.K. Ponde: Good Morning Everyone. Today, we have assembled here to hold a symposium on essential hypertension in which we will be discussing key topics on essential hypertension, which are relevant to our clinical practice today. These topics include some newer drugs; some re-focus on the newer diuretics, and of course, some key questions in the management of hypertension. I am Dr. Ponde, I am a consultant interventional cardiologist in Hinduja Hospital, Mumbai, practicing for the last 12 years, and there is an excellent panel of experts with me today and we are fortunate to have them today here with us. My co-moderator is Dr. Ajit Desai. Dr. Ajit Desai is known to all of us very well. He is a senior interventional cardiologist in the city of Mumbai. He has been a gold medallist in DM Cardiology Examination in Mumbai University. He has several national and international publications to his credit in various indexed journals. He has co-authored a book on clinical cardiology and echocardiography as well. He is a postgraduate teacher for the course of DM Cardiology in Mumbai University. Then, we have Dr. G.R. Kane. Dr. G.R. Kane is also a very well known interventional cardiologist in the city of Mumbai. Previously, he was the professor of cardiology in the Sion Hospital, now he is a professor and head of the department of cardiology at the D.Y. Patel Medical College, New Mumbai. He is a consultant interventional cardiologist attached to several different prestigious institutes in the city of Mumbai including Hinduja Hospital, Breach Candy Hospital, and Nanavati Hospital as well. He also has several publications, international and national, to his credit and also is the editor of several journals in the country. Dr. Ajit Desai: Good Morning. Amongst the panelist we have Dr. Chetan Shah who has been a renowned interventional cardiologist having experience of almost more than 2500 interventional procedures. He did his undergraduate and post-graduation from Seth G.S. Medical College, Mumbai, and did his interventional cardiology fellowship from Sir Charles Gairdner Hospital, Australia. He also has been a fellow at the University of Michigan and continues to be a fellow of that particular hospital. He has been the fellow of the American College of Cardiology and the American College of Physicians and also of the American Academy of Emergency Medicine. Also on the panel is Dr. Vivek Mehan, a very close friend and an associate. I do not think he needs to be introduced. He is a very versatile interventional cardiologist who had his training in intervention in the University Hospital of Geneva, Bern, Switzerland. He is a very astute interventional cardiologist who did his undergraduate and postgraduate from the K.E.M. Hospital and has an atlas on coronary angiography and angioplasty co-authored by Dr. Bernie Meier. He has many international and national publications to his credit, and in the past he was the chief of cardiology at the Cooper Hospital in Mumbai. Dr. C.K. Ponde: Finally, we have Dr. Dr. Rajesh Rajani who is a consultant interventional cardiologist at Hinduja Hospital, Mumbai. He has headed the department for a period of 3 years and he pursued his training of interventional cardiology in Australia. He has been a recipient of several awards including the Burgis Khurshedji Award and he has received several awards for the best paper presentations in various conferences. He has also several publications, both in national and international journals to his credit, and we are lucky to have him here today. 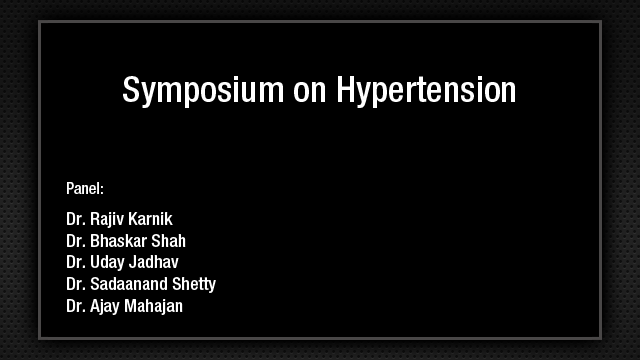 Dr. Ajit Desai: Well, friends, to start the symposium, I now invite Dr. C. K. Ponde to deliver his lecture on epidemiology of hypertension in India. Dr. C.K. Ponde: In the first opening session of this symposium, I will be spending really very few minutes on epidemiology of hypertension. As we know, the JNC-7 classification of hypertension into normal, pre-hypertension, stage 1, stage 2, etc. I will not spend much time into this, but to just give a bottom line of the slide, in India approximately 30% of the patients when they are detected for the first time, are in stage 2 hypertension and that is very very high figure indeed compared to the western counterpart. If you see the proportion of diseases attributable to hypertension, approximately 40% of the myocardial infarctions and strokes can be clearly attributed to hypertension, and as many as half of congestive heart failures and chronic renal failures can be clearly attributable to hypertension. In terms of vascular dementia, which is a relatively new entity because the population is growing older and we are seeing more and more older patients and as many as 50% of vascular dementias are attributable to hypertension. Globally, the prevalence of hypertension in adults above the age of 25 is approximately 20%. In India however in male population above the age of 40 the prevalence is approximately 33% and in females is around 31% and these are the WHO statistics of 2012. The cardiovascular mortality risk doubles with each 20 mmHg increase in systolic pressure and 10 mmHg increase in diastolic pressure. The figure may appear miniscule, 20 mmHg systolic and 10 mmHg diastolic, but that much of blood pressure reduction confers a tremendously increased relative risk reduction in terms of cardiovascular morbidity and mortality. If you look at the risk factors for development of hypertension, age is the most important risk factor. As you grow older, the prevalence of hypertension increases, but compared to the western counterpart, what we see in India is something little different. In Indian context, particularly Asia-Pacific, the BMI is closely associated with the prevalence of hypertension. That is not true in the Caucasians and the western world. In western world, you see people with much higher BMI and yet they are normotensive. Whereas, in Asia-Pacific, the BMI is very closely associated with higher prevalence of hypertension. When you talk of gender and race, before the age of 50, the females have a lower prevalence, but once they cross menopause, the prevalence becomes identical to their male counterparts. In terms of race, black individuals show higher prevalence of hypertension then their white counterparts and the mortality from hypertension in blacks is also 4 times higher then that in whites. When you do comparative assessment of race and ethnicity, strokes are more common in black people. Coronary artery disease is more common contrary to that in Asians, but both the groups, Asians as well as blacks, have higher incidence of chronic renal failure than their white counterpart and that is possibly because in these group of hypertensive people the other vascular risk factors like diabetes are also far in higher prevalence than their white counterparts. When you look at the meta-analysis of 61 prospective observational studies including 1 million adults, a 10 mm decrease in mean systolic blood pressure reduces approximately 30% risk of ischemic heart disease mortality and 40% reduction in the risk of stroke mortality. Now, this is an extremely important figure to remember because one cannot say that for age of 50, 150/90 blood pressure is acceptable or alright or okay. Because here again, elderly people benefit much more by reduction of blood pressure then their young counterparts. When you look at prevalence of hypertension in India, it is approximately around 36% above the age of 40, and the significant predictors of hypertension in India, are of course, age, and as I already said central obesity, inadequate physical activity, i.e., sedentary lifestyle, diabetes, and a low HDL cholesterol. These have come up as the most important risk factors, which predict development of hypertension and also predict the prevalence of hypertension in the given community and this is again the statistics of 2012 by Prasad, et al. When you look at the prevalence of hypertension in subgroups of Indian population; in women, the prevalence of hypertension is approximately 25%; in children, i.e., adolescents, it is around 3.4%; and the prevalence is much higher in urban India as compared to rural India. The urban Indian counterparts have a prevalence of hypertension approximately around 27% to 28% as against rural India which is around 9% and this again has much to do with lifestyle, particularly, the physical activity and the dietary intake of salt in rural India versus the urban India. When you look at the prevalence of hypertension in different regions of India, the south and west India have much higher prevalence of hypertension compared to north and east India. As you can see in the slide, south and west India has approximate prevalence of hypertension around 30% to 32% as compared to north and east, which is around 22% to 25%. When you look at the association of hypertension and diabetes, diabetes occurs in approximately 34% of patients with hypertension and on the other side hypertension occurs in approximately 70% of people with diabetes, but both these conditions individually are associated with very increased cardiovascular risk. So, when the combination occurs, it almost doubles or quadruples the risk of vascular event in a given patient. When you look at hypertension in CKD patients, the famous CREDIT Study has shown us that the prevalence of CKD is around 25% in overall hypertensive population and as against, if you take the CKD population in total, approximately half of the CKD patients have hypertensive at some course in their CKD. In the earlier CKD the prevalence of hypertension is lower, appropriately one-third, and as they progress, it almost becomes a universal phenomenon in patients with CKD. When you look at hypertension coronary artery disease, 90% of individuals received treatment of hypertension, when they were associated with coronary artery disease because that made them symptomatic, that is very important. Hypertension, per se, is a silent killer, as we know, but hypertension with coronary artery disease, they become symptomatic, they have angina, and then they are more likely to receive treatment and more likely to be treated to the target goals as compared to people with hypertension who not have coronary artery disease. Elevated blood pressure of more than 140/90, despite treatment is associated with increase risk of death, myocardial infarction, and stroke in patients with stable angina. If you look at proportion of mortality in India, the proportion of mortality of cardiovascular disease is around 24% and out of this cardiovascular disease as many as half of these deaths can be clearly and linearly associated with hypertension and that is all about prevalence and epidemiology of hypertension in India. Thank you. Dr. Ajit Desai: I think, Dr. Ponde, this was a very nice and concise presentation of the epidemiology of hypertension in India. I have just one single question for you and that is, in your clinical practice, how much is the percentage of patients who achieve the goal of control of hypertension? Dr. C.K. Ponde: That is a very good question, Dr. Ajit. I feel we must be seeing approximately at least 30 to 40 new hypertensive patients diagnosed every week and we put them on treatment. For several reasons, the most important reason I feel is that the awareness that bringing the blood pressure down to target level reduces my individual risk of getting stroke or coronary artery disease is much lower in our population today. The fault lies with us because we do not stress that you have to come to this goal to reduce your risk of mortality, stroke, and coronary artery disease. Secondly, the problem starts about compliance. The compliance problem is because probably the cost of the drug, the schedules of the drugs may not match their lifestyle, and the third could be possibly, I feel, the side effects may be occurring in these type of patients. But, despite all odds, I think no more than 30% patients achieve the target blood pressure in my clinical practice at least. Dr. C.K. Ponde: After setting the background with the epidemiology of hypertension, now I invite Dr. G.R. Kane to deliver his speech on the targets of blood pressure control in different underlying co-morbid conditions, Dr. G.R. Kane. Dr. G.R. Kane: Thank you, Dr. Ponde. Ladies and gentleman, it is my pleasure to be here with you all today to discuss about the blood pressure targets in different underlying co-morbid conditions and how to choose the right drug for the right patient. As it has been said by Dr. Ponde in the opening remarks, blood pressure is a silent killer, which most often goes undiagnosed until you have a major catastrophe, which is a cardiovascular event, and by cardiovascular event I mean either an MI or death, sudden death, or stroke which is a vascular event, which are the most important complications of hypertension in addition to the others like renal failure and cardiac failure, and today I am going to discuss with you some of the aspects of how we can choose the right drug for the right patient. At the outside let me say that what is most important in hypertension is controlling the blood pressure. So, how you control is much less important as compared to what drug you use. However, if you can choose a particular drug for a suitable patient's condition, it is always going to give him an additional benefit over and above the control of blood pressure itself. Like, for example, if you have somebody with a kidney disease, the blood pressure control will not only prevent cardiovascular events, but it may also prevent the kidney damage and progressive renal failure which can occur in this patient. We all know that in general the blood pressure goal is to get it below 140 systolic and 90 diastolic. However, in certain conditions, we have been getting the blood pressure to below 130 and below 80, especially in condition like chronic kidney disease, coronary artery disease, and diabetic patients. The reason why we get it at a lower level in these patients is because it has been shown by multiple trials that if you can achieve this goal, the progression of the disease of the kidney problems of diabetic, micro and macrovascular problems and the cardiovascular problems in coronary artery disease patients can be achieved at much better level than just getting it below 140/90, which is the goal for usual patients. What are the recommendations in the current guidelines and what are the thresholds and target BPs? All guidelines suggest that pharmacological treatment of pressures with hypertension should have treatment when the blood pressure is above 140/90. In patients with grade I hypertension which we have discussed in the last lecture and low or moderate cardiovascular risk this is an extremely important thing when you have less than 2 risk factors and reigning hypertension. One can start with nonpharmacological treatment and give an adequate time for the patient to get his blood pressure control without any medications. If it fails, antihypertensive therapy should be given. However, when your blood pressure is much higher and if you have 2 and more risk factors, it is invariably required that you start drugs along with nonpharmacological treatment right in the beginning. The algorithm, this is a famous algorithm which all of you know in JNC-7, the initial drug choices with and without compelling indications, and I will not go into details of that, the final aim of this is to get the blood pressure under control to the target level that we have set right in the first or the second slide of my talk. So I will go ahead with this one slide, which I just love, because this sort of simplifies. These are the UK guidelines, NICE Clinical guidelines. I would like to bring to your notice that step 1 in this sometime back remembered as ABCD, A and B were under 55 years old hypertensives and C and D were over 55. A was ACE inhibitors or ARBs and B is missing now, because the beta blockers, which were an important step of stage 1 drug therapy has now been relegated to a much lower level because multiple meta-analysis of randomized trials have shown that beta blockers are not as useful as was thought before. So, beta blockers have now gone down the ladder and you have only A, i.e., ACE inhibitors which is in under 55 years of age to be used as a first and over 55 you generally use a calcium channel blocker and thiazide-type diuretics. The reason for this is in older people it is the peripheral vasoconstriction and fluid retention, which is the primary cause of raised blood pressure, so those drugs are of more use there. Of course, step 2, if you do not control it, you combine drugs, like ACE inhibitors are combined with calcium channel blockers or diuretics. In step 3 when you do not control it, you can add all the 3 drugs together. At step 4, you can add still more drugs like beta blocker, alpha blockers, and so many other drugs or add 2 diuretics which are acting at different levels. Guidelines in India also almost follow the same like the NICE guidelines and the JNC-7 guidelines, they are not much different, but every organization comes up with its own guidelines. Now, lets come to the primary talk of my today's deliberation. What about associated co-morbid conditions? When you have diabetes, kidney disease, or other co-morbid conditions, hypertension management can be a challenge because the blood pressure is difficult to control, increase in therapy causes more adverse effects, there are more chances of increased cardiovascular events when you have co-morbid conditions, and this all leads to increase in cardiovascular or all-cause mortality, which is the primary aim of therapy in any condition of reduction. So, lets come to diabetes, this is one of the major groups that we have to deal with who have hypertension. Treatment should focus on effective blood pressure control, benefit the co-morbid condition including the cardiovascular and renal protection, avoidance of metabolic adverse events. We should not give any drug, which will increase the insulin resistance, so managing diabetes will be difficult because there are drugs, which are contradictory to the management and insulin secretion, and you must be able to prevent secondarily the cardiovascular events. So, which is the main therapy for diabetics? The main therapy is RAAS inhibition because this is very high in diabetics. It is advisable to choose an ACE inhibitor or ARB, whichever class is better tolerated. Major data goes for ACE inhibitors, but ARBs are equally effective and one of the two can be used depending upon the side effect profile. These 2 classes are considered as first line therapy because they reduce macrovascular disease in diabetics, prevent the progression of diabetic neuropathy, and do not increase insulin resistance. What happens when one drug cannot control it, can you add a calcium channel blocker or a diuretic? We have enough trials to show that a calcium channel blocker is as effective as a diuretic in combination with an ACE inhibitor in reducing cardiovascular morbidity and mortality. So, you can combine a calcium channel blocker or it has been also shown, especially in elder people, that a diuretic is a very good combination with ACE inhibitors as I have shown you before elderly respond better to diuretics. What about beta blockers in diabetics? The benefit of beta blocker is clear for only secondary prevention in diabetic patients, so the place for beta blocker in diabetic patients and patients who have angina, patients who have a post MI situation, patients who have a cardiac failure, where we have to start gradually increase in the beta blockers because they are absolutely been shown to reduce mortality and one must know that beta blockers may increase insulin dose requirement as it causes insulin resistance to a peripheral level. Having discussed about diabetes, now let us come to the next common condition where we have problem is chronic kidney disease. Antihypertensive therapy goal in CKD patients to get the blood pressure below 130/80 and you also need to protect the kidneys, so you need to have a reduction in glomerular capillary pressure, which will prevent the progression of renal damage and reduce proteinuria. One or two things here, many studies have shown to us that going below 130/80, what is the lowest level that you can go? It has been found that going below 120 is not necessary, it can be harmful, so the blood pressure systolic should be maintained around between 120 and 130 and a diastolic just around 80. You should use drugs, which will cause prevention of glomerular capillary pressure rise and prevent renal damage and RAAS inhibitors are recommended as first-line approach in patients with CKD because they cause both blood pressure reduction as well as they are beneficial in proteinuria and to prevent declining renal function. Now, if you cannot get control with 1 RAAS inhibitor, should you go for the combination of 2 inhibitors? There are number of trials which have shown us that we have used ACE inhibitors or ARB to the maximum tolerable level, addition of another ACE inhibitor or ARB to this combination, usually does not cause additional benefit, but may increase the risk profile. So, it is better to add either a diuretic or a calcium channel blocker in these patients. Diuretics are quite helpful because RAAS blocker with diuretic balances the limitations of both classes of drugs, diuretics corrects the problem of volume excess with RAAS inhibitors, the electrolyte imbalance resulting from diuretics is counter balanced by RAAS blockade and the metabolic changes of RAAS diuretics are also offset by RAAS inhibition. So, it is an excellent combination for us to use. Also, calcium channel blocker alone or in combination with RAAS blockade. Now, here there are certain suggestions, which I would like to give you. N-type calcium channel blockers, like amlodipine, which we have been using all this time has been found to increase proteinuria because it increases the glomerular capillary pressure and it can also cause podocyte injury. So, a calcium channel blocker of dihydropyridine blocker is not very good in combination in renal patients. However, the newer generation of calcium channel blockers, which is L/N dual type CCBs, which will be discussed in more detail by my friend, Dr. Rajani, are beneficial because they reduce glomerular pressure, reduce proteinuria, and inhibit RAAS activation. So, a combination of new generation with ACE inhibitors is an extremely good combination. Coming to hypertension with coronary artery disease patients. Hypertensive patients with coronary artery disease often have high BP, combination therapy is almost always required for blood pressure control, and RAAS blockade in combination with either calcium channel blockers or diuretics is highly helpful in patients with coronary artery disease. How do we prevent coronary artery disease and stroke, both are cardiovascular? When we say cardiovascular, cardiac is coronary artery disease and vascular is primarily stroke. So, you can see in some the slides that prevention of coronary artery disease is explained by the systolic blood pressure reduction, which is more important and that is why beta blockers have gone out of favor because they raise the central aortic pressure, though they reduce the peripheral radial pressure. So, ACE inhibitors are primarily given for systolic blood pressure reduction and stroke is reduced because of calcium channel blockers, which causes significant systolic blood pressure reduction. A few precautions when we use these different combinations in this group of patients; while using RAAS blockade, ACE inhibitor should not be prescribed in patients with history of angioedema or bilateral renal artery stenosis. When you are using an ARB, be cautious to combine with an ACE inhibitor because it increases the side effect profile without significant additional benefit in blood pressure reduction. Combination with spironolactone and ACE inhibitors may increase the risk of hyperkalemia, especially for the patients who already have chronic renal failure, so be cautious. You can use this combination when required, but one has to be careful that hyperkalemia is looked after. While using diuretics along, one can exaggerate electrolyte imbalance that may lead to conditions like gout or hyponatremia and hypokalemia. Diuretics are also known to impair glucose tolerance and decrease the insulin sensitivity. Some of the deleterious effects of thiazides can be blunted by combination with RAAS blockade, so use of 2 drugs in combination is helpful. While using calcium channel blockers, they are not suitable if there is evidence of heart failure or high risk of heart failure and nondihydropyridine calcium channel blockers like verapamil and diltiazem are good for CKD patients. However, especially in combination with beta blockers they can cause bradycardia and heart block. So, one has to be careful about that. While prescribing beta blockers, they are not preferred in the initial therapy of hypertension as I have shown you why. If therapy is initiated then you can add a calcium channel blocker rather than a thiazide diuretic because combination of beta blocker with a thiazide diuretic can increase the side effect profile of both and in turn make diabetes management difficult. Beta blockers can also exacerbate asthma, reactive airway disease. Friends, I have tried to discuss with you all the different combinations that help us to combine and give good control and reach target levels when there are co-morbid conditions. Thank you very much for your attention. Dr. C.K. Ponde: Thank you Dr. Kane for that very lovely, concise presentation on the choice of drug in different co-morbidities. I have one question for you, suppose, you have a patient who is diabetic and as you said, diabetes is a compelling indication to use an ACE inhibitor on ARB, and your choice that the patient is given ACE or ARB, which is not controlling blood pressure very well, but which is a compelling indication to use that drug in diabetic population and as against a calcium blocker controls the blood pressure very well, in that given patient, then which one will you choose? Will you choose still an ACE and ARB and keep on increasing the dose or will you shift to calcium channel blocker, which controls the blood pressure very well, but does not give you benefits like in the diabetic population like an ACE or ARB. Dr. G.R. Kane: Yes, it is an excellent question, Dr. Ponde, but I think usually the first thing I would do is, I will go to the maximum level of ACE inhibitors and if it does not control then I would by and large combine it with a calcium channel blocker. But, as you have put it in a way that calcium channel blocker is controlling the blood pressure very well, I feel this is a little bit short of a situation, which is I would say not easily seen, but suppose that happens, then maybe I would use only calcium channel blocker because that is controlling the blood pressure well. The reason for this is that we have said time and again that the first and the primary importance of controlling blood pressure is to get the blood pressure down, the other advantages are secondary. Dr. C.K. Ponde: So, the message is whichever drug you use is of secondary importance, the first important concept is to get the blood pressure to the target level with whichever possible drug and to get to a target level if you have to combine 2 drugs, so be it. Dr. Ajit Desai: Dr. Kane, that was a nice presentation. One more additional question on the same basis. Would you in diabetic patient use ACE inhibitors or ARB or would you prefer to use as a combination together with amlodipine in these subsets of patients. Would you be able to give us some data about some trials? Dr. G.R. Kane: Yes, because this has been studied, I think, primarily in a large trial called ACCOMPLISH Trial, where they tried out ACE inhibitors and amlodipine combination versus an ACE inhibitor versus a diuretic combination and what they found was that both the combinations were equally effective. However, the ACE inhibitors and amlodipine combination was little better, though not statistically significant, in reducing the cardiovascular mortality and cardiovascular events. So, this is an excellent combination and I would go for that hands down, particularly in the diabetic patients. Even the ALLHAT study also showed the same thing with a different combination of perindopril and amlodipine trial particularly. Dr. C.K. Ponde: I think in that trial what was shown was that the amlodipine/perindopril combination reduces central aortic pressure much better than one drug alone. Dr. G.R. Kane: Yes, so that was the advantage of this combination. Dr. C.K. Ponde: Now, see there are so many combinations in the market Dr. Kane, available as combining ACE inhibitor and an ARB together and we know from trials which use combination of valsartan and enalapril or losartan and enalapril that these combinations increases the risk of hyperkalemia. Now, if you ask in today's world, which are the subgroup of patients in which you will use this combination? Dr. G.R. Kane: Dr. Ponde, this is the best question you have asked me today and in fact I actually wanted to cover this up in my talk also, but I probably missed it out. It is an excellent question, why specifically, because I have seen in my practice that people are using randomly this combinations and we do not know what is happening to the people, because it had been shown clearly by trials that when you combine ACE inhibitors and ARBs you hardly have any additional benefit except in some circumstances, I will come to that. But the side effect profile, especially the creatinine rise and hyperkalemia, very very dangerously high levels can be reached. So, this combination, one should be extremely careful. As far as possible, avoid it. One situation which I can think of, and you can add to my knowledge, where you have excessive proteinuria, one of the reasons in CKD patients is you give ACE inhibitors to reduce blood pressure, at the same time prevent the albuminuria, which is the secondary risk factor for cardiovascular mortality and morbidity and also prevent the renal dysfunction of progressing. So, if the proteinuria is excessive and after giving ACE inhibitors, even if the blood pressure is controlled, it is advisable to add ARBs sometimes simply to reduce the degree of proteinuria. So, maybe that is one situation where I will use it, and if you are at all using it for any other indication, one has to be very careful for the side effect profile I would say that. Dr. C.K. Ponde: So you have to follow these patients very very closely with potassium and creatinine rise, and if that occurs, you have to withdraw this combination. Dr. G.R. Kane: Absolutely, if any 30% rise of creatinine or potassium, this combination should definitely or in fact even both the drugs will have to be withdrawn before that much rise. Dr. C.K. Ponde: This question I brought up in particular because so many combinations are there in the market and randomly, even young people are prescribed this combination as a first line therapy in fact without even diabetes. Dr. G.R. Kane: I think that would be one of the most important message of this symposium that we need to be careful in certain situations. Thank you very much. Dr. Ajit Desai: Well friends, now I call upon Dr. Chetan Shah to give his talk on emergence of chlorthalidone, its efficacy and safety, in the blood pressure control. I would rather modify the topic and say, its re-emergence of chlorthalidone and the safety and efficacy in BP control, Dr. Chetan Shah. Dr. Chetan Shah: Thank you Dr. Ajit, thank you Dr. Shekhar for getting me here. What I will be stressing is, we have been using chlorthalidone for many many years, but of late, there has been a lot of news, lot of studies, lot of trials about re-emergence of chlorthalidone in clinical practice. Now, lets talk about thiazide-type diuretics in clinical practice. They principally act on distal convoluted tubules, inhibit the sodium chloride transporter. Current guidelines suggested thiazide-type diuretics as first-line treatment, now we have thiazide diuretics like hydrochlorothiazide, chlorothiazide, and we have thiazide-type diuretics like chlorthalidone, metolazone, and indapamide. Current guidelines list several options, but do not reveal the preference between them. Of late, as I said, there has been a lot of editorials, lot of articles, lot of studies on use of chlorthalidone in various hypertension journals and various cardiology journals. National outpatient prescription data from 2003 to 2008 shows that the trends have changed. Number of new users of hydrochlorothiazide have decreased by nearly 30% in this period, number of new users of chlorthalidone have increased by more than 40% and proportion of patients using chlorthalidone has almost doubled in last few years. Now, what is good about chlorthalidone? There are interesting things about chlorthalidone. It has long plasma half-life, 40-60 hours, for chlorthalidone as against 3.2 to 13 hours for hydrochlorothiazide. Chlorthalidone extensively partitions into red blood cells and is slowly released into plasma, hence the long half-life. What is the advantage of the long half-life of chlorthalidone? The post diuretic period of antinatriuresis, the "breaking phenomenon," is less likely to occur; greater systolic blood pressure reduction than hydrochlorothiazide within the dose range of 12.5 to 25 mg, which is commonly used in clinically practice; and greater nighttime systolic blood pressure reduction. Now, if we see, the change in systolic blood pressure throughout the day we have blue bar with hydrochlorothiazide and yellow bar with chlorthalidone. If we have a look then early morning surge, which is there with hydrochlorothiazide is not there with chlorthalidone. This is extremely important. Maximum major adverse cardiac events occur in that early morning period with that early morning surge. So, that is being prevented by chlorthalidone. Now lets go to the MRFIT trial, the Multiple Risk Factor Interventional Trial, which took about more than 12,800 patients and followed them up for more than 10 years, after 7 years the coronary artery disease mortality in hydrochlorothiazide group was 44% higher than the chlorthalidone group. Hence, the advisory board concluded that chlorthalidone and not hydrochlorothiazide should be the Step 1 diuretic for hypertensive patients. Subject shifted to chlorthalidone treatment and at the end of followup period, the rate of coronary heart disease mortality in the clinic decreased by 28%, so lesser cardiovascular mortality and greater blood pressure reduction with chlorthalidone than hydrochlorothiazide. As I have already said, the major adverse cardiac events were slightly less with the chlorthalidone group and the left ventricular hypertrophy; the regression of left ventricular hypertrophy was significant with chlorthalidone group as compared to hydrochlorothiazide. Now, if you look at the major coronary events or the major adverse cardiac events of the other trials. Now, lets take ALLHAT trial, in that chlorthalidone was superior in reducing heart failure and major coronary events as compared to lisinopril and amlodipine and it is better than lisinopril in preventing stroke. Now, going on to the Systemic Hypertension Evaluation Program in elderly, i.e. SHEP study, in elderly patient with isolated systolic hypertension, chlorthalidone reduced total stroke by 36%, major adverse cardiac events by 32%, and all-cause mortality by almost 13%. Now, if we look that systolic hypertension with chlorthalidone therapy for 4-1/2 years were associated with longer life expectancy at 22 years of follow up, each month of receiving active therapy was associated with an additional day free from risk of cardiovascular death. So, I thought this was extremely significant. All thiazide-like diuretics are not chlorthalidone. We have pleiotropic effects of chlorthalidone. As we have pleiotropic effects of statin, we have pleiotropic effects of chlorthalidone. Chlorthalidone reduces the incidence of thrombotic stroke or myocardial infarction by inhibiting catecholamine sensitive carbonic anhydrase in platelets and vascular smooth muscles. Chlorthalidone diminished the vascular endothelial growth factor C gene transcription, which is known to induce pulmonary edema, the hallmark of congestive heart failure. Chlorthalidone also down-regulate the transcription of transforming growth factor B3 and prevent the target organ damage. Now, if we have a look at this, there are 3 main things; stroke, congestive heart failure, and renal damage which are caused by hypertension. Now, this epinephrine surge, which is there in patient with hypertension, there is inhibition of carbonic anhydrase by chlorthalidone which results in decreased vascular contractility and decreased platelet aggregation and a decreased incidence of stroke. We have chlorthalidone, which inhibits vascular endothelial growth factor C, which results in decreased vascular permeability, decreased incidence of pulmonary edema, and decreased incidence of congestive heart failure. We have this transforming growth factor, B3, which is responsible for collagen deposition. Now, chlorthalidone inhibits that and there is a decreased collagen deposition, ultimately renal damage. So, these effects, I thought were extremely important with chlorthalidone. It has effect on peripheral resistance also. Now, chlorthalidone has direct vasodilatory effects, perhaps separate from the diuretic effect. Chlorthalidone responds to ANG-II or norepinephrine, there is attenuated increase of systolic blood pressure, inhibited vasoconstriction of aortic rings, and decrease RhoA and Rho kinase in vascular smooth muscle cells. Chlorthalidone has favorable metabolic profile as seen in MRFIT trial. The patient who were on chlorthalidone, there was a reduction of total cholesterol, there was a decrease in LDL cholesterol, and there was no significant incidence of new-onset diabetes, so it was found to be significantly better than hydrochlorothiazide in maintaining a very good metabolic profile. Now, lets talk about hypokalemia. Hypokalemia is one of the major side effects of diuretics, the change in potassium for chlorthalidone and hydrochlorothiazide by dose using pooled data from all studies. The mean loss of potassium for chlorthalidone and hydrochlorothiazide at clinically relevant doses of 12.5 mg of chlorthalidone and 25 mg hydrochlorothiazide were comparable. Chlorthalidone was slightly better than hydrochlorothiazide. Chlorthalidone or diuretic causes hypokalemia, so how do we balance the effect? We can balance it by using either angiotensin-receptor blocker or an ACE inhibitor. Now, 12.5 to 25 mg dose of chlorthalidone induce hypokalemia effects about 13% of individuals and about 10% of patients taking ARB or ACE inhibitors develop hyperkalemia. Now, we can balance this by using a combination of both. The chlorthalidone induce hypokalemia is effectively offset by the potassium sparing effect of ACE inhibitors or ARB if we use them in combination. Now, in this particular study, an ARB was used in combination with chlorthalidone and when the ARB was not used, the incidence of hypokalemia was almost 9.3%, when 20 mg was used 2.6%, and when 40 and 80 mg ARB was used it was about 0.7%. Hyponatremia was not significant with any level of chlorthalidone. So, additional azilsartan progressively neutralized the effect of chlorthalidone on potassium and sodium balance. The risk of diabetes, you know, diuretic cause increased risk of new-onset diabetes. Now, the risk with chlorthalidone was about 1.25 as against risk with non-chlorthalidone thiazide-type diuretics was 1.48 and diabetes mellitus diagnosed during chlorthalidone not associated with an increase in cardiovascular mortality as compared with diabetes mellitus in the absence of diuretic. Now, these are the recent clinical studies, chlorthalidone plus azilsartan published in American Journal of Medicine and Journal of Clinical Hypertension and this particular combination has been approved in USA, chlorthalidone and candesartan combination. So, these are the combinations, which have been approved for use in USA. In conclusion, I would say that chlorthalidone is an excellent agent. It is one of the drugs, which has been extensively used of late and it is extremely useful in the management of hypertension and you know in order to prevent the incidence of hypokalemia, can be used very well with either an ACE inhibitor or an angiotensin receptor blocker. Thank you very much. Dr. Ajit Desai: Dr. Chetan, that was a wonderful presentation and I appreciate for bringing out such wonderful and salient features of chlorthalidone of late which has been used so frequently as the first line of diuretics in hypertensive patients. I have a question for you, in the elderly hypertensive patients, do you think diuretics should be the first line of choice, and if so, why? Dr. Chetan Shah: That is a very good question, Dr. Ajit. As we have seen in lots of trials, diuretics can be first line treatment as we have seen in SHEP study, i.e., systolic hypertension for elderly individuals diuretics have given a very good response, decreased major cardiovascular event, decreased incidence of stroke. Also, ALLHAT study was not for elderly patients, but 60% of the patients were above age of 65 and diuretics were extremely useful and extremely effective as first-line treatment in all these patients. Now, there was only a study, which did not show significant benefit and that was ANBP2 study. Now, what it was? They compared an ACE inhibitor with a diuretic in that particular study. That was an open label study, that was not a double-blind study of diuretic versus ACE inhibitors in which ACE inhibitors were found to be better than diuretic, but besides that, all other studies there was an evidence that diuretics can be used as first-line treatment in all these elderly patients. Dr. Ajit Desai: Thank you. Dr. C.K. Ponde: Thanks, Dr. Chetan for that. Now, in your talk I saw that you compared the chlorthalidone versus the thiazide-type of diuretic and thiazide diuretics, but how do you rate? There is another molecule available in the market, which is indapamide, and indapamide also is metabolically neutral and causes less degree of hypokalemia and hyponatremia. So, if you have to compare, let us say, indapamide versus chlorthalidone head on, for the systolic blood pressure reduction and for the incidence of this metabolic side effect, how would you compare them? Dr. Chetan Shah: That is a good question. Indapamide is a great molecule and I would say, there have been lots and lots of trials of noninferiority. So, I would say chlorthalidone is nor inferior to indapamide, indapamide is excellent, there is less incidence of new-onset diabetes, there is less hypokalemia, there is less hyponatremia, there is less impotence with indapamide, but chlorthalidone I would put as a non-inferior molecule. No, I would not say that it is better than indapamide, but it may not be too inferior to indapamide, but it is definitely better than hydrochlorothiazide. Dr. C.K. Ponde: There was a trial in which the perindopril was compared with indapamide and there have been combinations in the market of perindopril with indapamide. That is why I was concerned that whether the systolic blood pressure reduction with chlorthalidone is identical with that with indapamide? Dr. Chetan Shah: What I have concluded from all these trials is that chlorthalidone is non-inferior to indapamide. I would not say that systolic blood pressure reduction is better than indapamide with chlorthalidone, but it is not so inferior to indapamide. Dr. Ajit Desai: Dr. Chetan, one more additional question to what we have been discussing. In all these hypertensive patients, the first line of treatment is either a thiazide diuretic or a thiazide-like diuretic. In which of these patients would you think a loop diuretic would be better as compared to this? Dr. Chetan Shah: I would say that a loop diuretic comes into picture in patients with renal disease. With chronic renal disease, a loop diuretic like furosemide or torsemide would be a good agent to use and in patients with refractory heart failure, they are of very great use in patients with refractory heart failure. So, I think these are 2 indications where a loop diuretic would score over thiazide-type diuretic or thiazide diuretic for control of hypertension. Dr. Ajit Desai: So, in other words, when you have essential hypertension per se, then the thiazide or the thiazide-type diuretics are the first choice as compared to co-morbid conditions of congestive heart failure or kidney failure. Thank you very much. Dr. C.K. 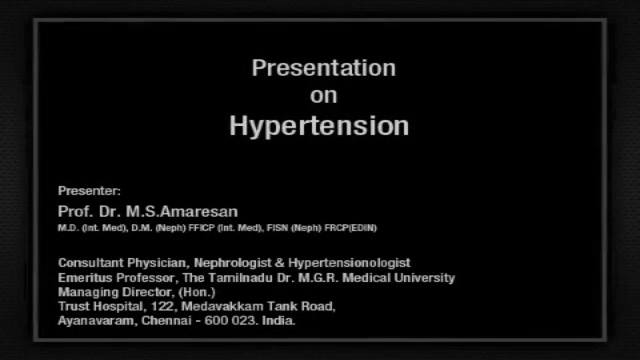 Ponde: Now I invite Dr. Vivek Mehan to deliver his speech on isolated systolic hypertension which we know is a distinct entity, difficult to treat, and is associated with lot of tricky points in the management and workup of these patients. Dr. Vivek Mehan: Thank you Dr. Ponde, systolic hypertension is a different animal from what we being talking about so far. Until a few years ago when nobody even considered systolic blood pressure as cause of problems, we always said that blood pressure should be 160 plus for older people beyond the age of 60 and nobody really considered systolic blood pressure as an important aspect. The JNC-7 however brought out, as you can see in the last column, the concept of isolated systolic hypertension wherein they brought out the importance of measuring and treating blood pressures, as far the systolic blood pressure itself is concerned. So, they defined this criterion of isolated systolic hypertension where a BP of more than 110 systolic in the presence of a normal diastolic blood pressure. Several years ago, our teachers never bothered about treating a patient with this sort of blood pressure control, but now we know that this is important. What is important about blood pressure is that as age rises, systolic BP will rise. Diastolic BP may remain the same after the age of 50 or sometimes even falls, and if you look at this particular slide you realize that hypertensives before the age of 40 predominantly have diastolic hypertension or what is called as systolic-diastolic hypertension. As age progresses further and further, the incidence of diastolic alone or systolic diastolic hypertension reduces and what is seen more and more is only systolic hypertension and this almost contributes for more than 90% of patients beyond the age of 50 who have hypertension. So, systolic BP is not something to be swept under the carpet, the awareness of this has been growing over the last couple of years. Systolic blood pressure itself associated with the increase risk of coronary artery disease, left ventricular hypertrophy, renal insufficiency, stroke, cardiovascular mortality and JNC-7 has said, as I mentioned, that after the age of 60, the systolic blood pressure is much more important as far as risk factor for cardiovascular events is concerned than diastolic blood pressure, that is important. So, beyond the age of 60 the systolic blood pressure is more important than diastolic blood pressure. So, in older individuals, focus attention more on systolic than diastolic blood pressure and this is difficult, because systolic blood pressure is difficult to treat, and is very difficult to control. Diastolic pressures are more important and more easy to control than systolic blood pressure, which is why, as I mentioned in the beginning, systolic hypertension is a totally different animal, which is why I think that touching up on this topic for this symposium is an important and an intelligent step taken by the organizers. We all know that the blood pressure measurement in the elderly is difficult because we know about the auscultatory gap, we know about the stiffening of the coronary arteries, we know about pseudohypertension wherein you can underestimate or sometimes overestimate, if you are not careful, the blood pressure. The auscultatory gap if you are not careful about, you miss the blood pressure readings and the stiffening of the blood vessels can lead to pseudohypertension, which is important because we will touch upon the concept of the central aortic pressures in a few minutes. So, what is isolated systolic hypertension or ISH? You need to have 2 things. One is systolic blood pressure more than 140 along with a diastolic blood pressure less than 90. If you have both, the diastolic blood pressure also rises, than you cannot call it isolated systolic hypertension. The systolic blood pressure is an independent risk factor the importance of which exceeds the risk of an elevated diastolic blood pressure in elderly and is a more important risk than diastolic blood pressure as far as cardiovascular and renal disease is concerned. This has been clearly shown by the JNC-7. What is the cause of this isolated systolic hypertension? It is caused because of loss of the elastin, which causes the arteries to expand with each cardiac contraction, is degraded by age, this is further increased by the accumulation of arterial calcium and therefore the compliance reduces and the elasticity reduces and these arteries become stiff. As a result of these arteries getting stiff, the blood pressure which is reflected wave, if you know the blood pressure curve, you have a to have anacrotic wave followed by a notch, which reflects the reflected wave from the periphery. This reflected wave adds on to the forward compression of the heart causing a rise in the systolic blood pressure. So, people have now not only measured the systolic blood pressure but also elevation of the arterial pressure, the systolic minus the diastolic pressure. So, this pressure gradient is also an important measurement of what is happening in the cardiovascular system. As a result of this blood pressure rising it further propagates the arterial stiffening and this further impairs vasodilatation and this is a vicious circle. The risk factor for stroke and ischemic heart disease doubles with every 20 mm increase in systolic blood pressure. So, if you reduce the blood pressure by 20 mm, you reduce the risk of a stroke or ischemic heart disease by half; thereby, the importance of treating such patients. There has been this trial recently published in November issue of the Journal of Clinical Hypertension, where they are now trying to measure the fractional flow reserve in coronary arteries and they found that fractional flow reserve in patients with pure systolic hypertension is worse than those who have mixed systolic and diastolic hypertension and which is because of this trial and other studies that the concept is now coming in. At least people are trying to wonder that is the systolic blood pressure alone, even worse than both systolic and diastolic blood pressure, because of the concept of the pulse pressure, which I mentioned earlier, the pulse pressure being higher. Unfortunately, like all clinicians you must have noticed that treating systolic blood pressure in the elderly is not so easy. I mentioned earlier that as the person grows old, the systolic blood pressure rises, but the diastolic blood pressure can actually fall. So, you have patients who have blood pressure of 180/70. So, what happens, how do you treat such a patient? Whether you lower the blood pressure systolic, the diastolic is bound to come down? So what happens, remember the benefits of lower blood pressure, it has a J-shape curve. If you keep lowering the blood pressure, the risk keeps falling up to a certain degree. You cannot lower the blood pressure further and further and get lower and lower risks, because the further you reduce the blood pressure, the risks again start rising as the J-shaped curve and this happens because coronary circulation happens in diastole. So, if the diastolic pressure is low, there is less coronary circulation and mortality rises. Rotterdam Study was one such study which showed that the risk of stroke and also cardiovascular mortality was higher in elderly patients in whom you reduce the diastolic blood pressure less than 65. Now, that is a major dilemma for the clinician. I have a patient with systolic hypertension, I try to reduce the systolic hypertension but the diastolic also fall, what do I do? We will try to address that in a minute. So, there is a risk of increasing mortality of having or worsening the condition if you try to reduce systolic blood pressures to such an extent that the diastolic pressures will fall below 65. So, the magic figure is 65 to 70. Do not reduce systolic blood pressure so much that your diastolic blood pressure fall less than 70 for you not getting benefits at that stage. What about very old patients? In observation studies, beyond the age of 85, you should not even probably try to reduce blood pressure unless it is very high, because there is mortality. As people grow older, they need probably higher pressures and the ones who have lower pressures, especially beyond the age of 85 have higher mortality. So, when you come across a patient who is 80-85 years old, do not be too aggressive about lowering the blood pressure to those so-called 140/90 levels. How do you evaluate a patient with isolated systolic hypertension? It is like for any other patient, which you heard by the speakers, you look at the other organs, you look for secondary causes, you examine the thyroid, lungs, you do urine, blood glucose, ESR, ECG, etc. So, the examination or the evaluation for patient with isolated systolic hypertension is the same as you evaluate any patient with hypertension. There have been many trials, which have been mentioned by the earlier speakers. The SHEP (Systolic Hypertension in Elderly Program), in this trial they started treating patients who had stage 2 systolic hypertension, i.e., where the systolic blood pressure was more than 160. So, this trial did not treat patients with systolic blood pressures between 140-160 by pharmacology. They of course gave them lifestyle modifications and nonpharmacological treatment, which should go on irrespective of blood pressure, but the pharmacological treatment in these patients started at 160. I point this out to you to tell you that when you are treating very old patients do not be aggressive as far as starting somebody who is 80 years old with a BP of 150, do not try to bother about pharmacological therapy in patients. These trials and meta-analysis of various trials showed that in patients with isolated systolic hypertension, treating of these patients reduces all-cause mortality, cardiovascular mortality, and stroke. So, 3 major questions that you should ask yourself. At what level should you start treating such patients? As I mentioned, go by age. If it is a young man who is 40, 50, 60 you should probably be more aggressive. With an older person do not be so aggressive. What drug should be used and to what level should the blood pressure be reduced, we will come to in a minute. As I told you in the SHEP trial, they started pharmacology at the level of 160 mm systolic. The recommended target once you start treatment is probably 140/90 in the younger age group, which I mean is less than the age of 70, and in diabetics or who have severe end-organ damage you should probably aim for a lower goal of less than 130/80. Remember do not allow the diastolic blood pressure to fall less than 65, especially in the older individual. Do not forget about the non-pharmacological strategies and drug treatment forms a center, but is not the only treatment, let us not forget about that. So, let us first consider the left panel. If you have stage 1 systolic hypertension, which is blood pressures of 140-160, concentrate on lifestyle modification. If you cannot manage your drug therapy, if you cannot manage your target levels, then start off with thiazide-type diuretics. Chlorthalidone is a good drug. If they do not succeed then you can add other drugs, maybe a second-generation calcium channel blocker is a good drug to add on. A stage 2 ISH (isolated systolic hypertension) is treated in addition to lifestyle therapy with the combination of either 1 or 2 drugs; a thiazide-type diuretic should be one of the drugs of this combination. Of course, as was mentioned by one of the previous speakers, if there is a compelling indication or patient has co-morbidities then adjust your therapy depending on the co-morbid conditions. To summarize, in such patients thiazide-type diuretics are the best initial drug treatment. Also, consider the slow-acting calcium channel blockers. In patients who have other co-morbid conditions, think of ACE inhibitors or ARB. The patients, who have post myocardial infarction, think of ACE inhibitors and beta blockers and often, as is the case in systolic/diastolic hypertension or isolated diastolic hypertension, combination therapy will be necessary. I only want to conclude by the final slide that we must use our commonsense, we are clinicians, decide when to initiate therapy, do not be aggressive if you have an 85-year-old man who has a blood pressure of 170/70, I would not treat him. Whether to treat such old patients is your decision, you are the clinician. How much to lower the BP is up to you to decide. As you often see in older patients, you start treating them for hypertension, BPs fall, and they become sluggish, they start forgetting things, they feel worse and look worse than they were before you started treatment, accept a little higher levels. Look clinically and carefully that what effect your treatment is having on the diastolic blood pressure and how the patient feels. Sometimes, we must have a healthy disregard for western guidelines. Let your clinical skills overrule the "Armchair Rule Makers" who have defined preset deadlines for you. They are for the general population, not for a specific person you may be treating. With these few words, I just want to thank you for the attention. Dr. C.K. Ponde: Thank you Dr. Vivek for that lovely presentation on systolic hypertension, particularly focusing on the elderly population. I got a very tricky question for you and this question is regarding the literature, which says that whenever you get isolated systolic hypertension, whichever the population, particularly the elderly of course, there is very high incidence of carotid artery stenosis and significant renal artery stenosis. So, what is your take on this? I mean, have you ever seen this in your clinical practice? Dr. Vivek Mehan: Yes, obviously, literature reflects what you see in reality and you see systolic blood pressure is probably more damaging to the elastin than diastolic blood pressure, so it follows that these larger vessels are affected more when the systolic blood pressure rises. So, it has always been at least my practice to look for carotid bruits and renal bruits in such patient. So, if the incidence is higher, you must look for it more aggressively, and especially one little hint to the audience is that if you have a patient in whom you cannot control the systolic blood pressure too easily, get an ultrasound done of the renal arteries. If you find a renal artery stenosis, it is easy to treat and you get your blood pressure down. So, if the incidence is high then it should be looked at aggressively. Dr. C.K. Ponde: You will screen then every elderly patient; let us say above the age of 65, who comes with a very high systolic blood pressure. You will advice that every such patient should undergo renal Doppler test or you will select the patient who is not easily controlled? Dr. Vivek Mehan: If I have unlimited funds and patient has no problem about doing it, why not? But you are a clinician, if BP comes in control nicely and there is no renal bruit, then no point probably doing it. But in an utopian atmosphere, sure, why not? Why not if you can do it for everybody, but these are expensive tests, it is not worth doing it, but keep your suspicion level low, keep your threshold low to get these tests done and carotid screening is just for knowing what is happening and let us not forget that the addition of statins as a drug for these patients may be a good idea. Thank you. Dr. Ajit Desai: Dr. Vivek, you have touched upon a very important aspect of hypertension, i.e., isolated systolic hypertension, and I feel that the concept of isolated hypertension has still not percolated in the physicians and the general practitioners and it is very important aspect which I think needs to be addressed to the physicians and the general practitioners that it is extremely important to control the systolic hypertension. I have an important question for you and that is related to the central aortic pressure. Do you feel that there is a correlation between isolated systolic hypertension and central aortic pressure and does the concept hold true in the elderly patients also? Dr. Vivek Mehan: You see the central aortic pressure for the sake of the audience is pressure, which is directly measured by invasive techniques. Now they have noninvasive ways by which they measure the pressure pulse. I told you, you have an anacrotic wave followed by a notch, so they have mathematical formulas, which measure this and then calculates the estimated central aortic pressure. I have seen in patients with systolic hypertension alone because of the stiffening of the wall, loss of the elastin, that what you measure as BP is often lower than central aortic BP. So, your actual BP in these patients can have big difference and that has been shown in various trials. It can be as much as 10-15%. You measure a BP of 160, but it actually maybe 180, so it is even more important to know the central aortic pressure in such patients. The only problem is that in the elderly. In the elderly what happens is that the forward pumping action of the heart falls. They have dysfunction for other reasons. There because the central aortic BP is a combination of the forward pumping and the reflected wave. Since the forward pumping falls at that time this correlation as I told, the over exaggeration which you get may be lost in the very elderly. So, once a person goes beyond the age of 80-85, then the difference in the central aortic pressure and the measured pressure can fall, but up to that age, central aortic pressure is almost always higher than the measured systolic pressure. You have now more and more central aortic pressure measurements by little wrist devices. They do not actually puncture the artery, but they measure the pulse waves and mathematically derive the estimated central arterial pressure or central aortic pressure, which has been correlated clinically and people have actually measured it intraarterially with this. So, we are going to see this more and more as time goes ahead, but at the moment it is just necessary to know that if you have systolic hypertension, do not ignore it because central pressure is probably even higher than what you measure. Dr. Ajit Desai: That would be an important factor in treatment part. Dr. Vivek Mehan: Dr. Ajit, you and I when we were students were never taught the importance of systolic hypertension, it is only now that we realized that we have been missing on a large population and that is the importance of such presentations and such forum. Thank you. Dr. Ajit Desai: Well friends, now I call upon Dr. Rajesh Rajani to speak and enlighten us about the fourth generation calcium channel blocker, which has come up rapidly in the treatment of essential hypertension. Dr. Rajesh Rajani. Dr. Rajesh Rajani: Hi friends, thanks for having me over. What I am going to do in the next 10 minutes is just speak to you about cilnidipine, which is actually the latest calcium channel blocker in the scene and we know that calcium channel blockers are the most widely used calcium channel blocker antihypertensives in the world today. Lets go through the whole thing and unfold it. Now, sympathetic over activation is one of the major factors implicating the onset of hypertension and increased sympathetic outflow attributes a neurogenic character to essential hypertension, which is very important to understand and sympathetic overactivity is 5 times more frequently observed in hypertensive compared to normotensive subjects, we all know that and that is where cilnidipine is going to score over. We know that there are 2 types of receptors as we can see, one is the N-type calcium channel receptors, which regulate the release of neurotransmitters affecting cardiovascular functions. Now they are basically teamed up in the neuroterminal endings. The N-type calcium channels makes around 80-90% of the whole current release of norepinephrine and the L channels only 10% and hence it is very important that we have the N blockers which prevents the release of norepinephrine surge, which is so important in the pathogenesis of hypertension. Cilnidipine is a unique molecule because not only does it block the L-type receptor. Now L-type we know friends actually cause vasoconstriction and cilnidipine by attacking the L-type actually cause vasodilatation, which is nothing new because most of the calcium channel blockers do that. Where it scores over is actually attacking the N-type terminals and preventing the surge of norepinephrine. That is where the whole advantage of cilnidipine comes and it where it scores the merit over the other traditionally used calcium channel blockers. Its pharmacological profile is equivalent to combination of pure L-type pulse alpha and beta adrenergic receptor antagonist. So, we have a summated package used in this calcium channel blocker, which possibly will add to the advantages of all the other drugs also like ARBs, ACEIs in combination as we will see. Now, if you see the dual-action of cilnidipine, very nicely illustrated in this particular slide. We have the pure L-type calcium channel blockers, which actually cause vasoconstriction and cilnidipine inhibiting that causes dilatation. Nothing new about it because most of the calcium channel blockers do that. Where it scores over, as you can see, inhibiting the norepinephrine release. Norepinephrine release causes 3-way pronged effect, which actually causes vasoconstriction, increase the force of cardiac contraction, increase the heart rate and decrease the renal blood flow and renin secretion. Now all these things are abated by the N-channel blockage and that is what the trump of cilnidipine is as can be seen in this beautifully illustrated slide. Blood pressure and controlled heart rate: BP reduction is comparable to amlodipine as far as the comparison to it is concerned, effectively addresses morning hypertension and white-coat hypertension, which is a unique effect of the N-channel blocking system because when one gets up in the morning, there is a symptomatic surge and especially white-coat hypertension. Friends, we all know, that once a patient walks in a doctor's clinic, 37%-40% of them have a surge in high blood pressure, which actually this can take care of. So, reduction of heart rate from baseline by N-type calcium channel blockers by inhibition of L-type calcium channel blockade induced increase in the heart rate. Now, in this slide you can see that the action of cilnidipine with amlodipine is that the P value is not every significant as far as the blood pressure control is concerned. So, in effect, what it does is that once a day dose is efficient in controlling the inhibition of morning activation of sympathetic nervous system as we saw earlier and also control the white-coat response as done in the Japanese study. In this meta-analysis of 800 patients where cilnidipine was compared to amlodipine, no significant differences in the efficacy between these 2 molecules were observed as can be seen. Cilnidipine and RAS activity: Now, cilnidipine compared with amlodipine, the major effect which was seen was that the RAS activity was significantly reduced by cilnidipine. As can be seen, cilnidipine suppresses the ARB induced increase in RAS activity. Both the PRA as well the plasma angiotensin II levels. In this slide, we can see the comparison or combination of valsartan with cilnidipine and valsartan with amlodipine and you can see that the PRA activity was far lesser with valsartan plus cilnidipine as compared to valsartan with amlodipine and the angiotensin II levels also were quite less. In the CARTER Study it was evaluated whether cilnidipine had an impact in the control of proteinuria. We can see in this slide that cilnidipine is superior to amlodipine in preventing the progressing of proteinuria when coupled with a RAS inhibitor, much more than amlodipine. How it does so? We will see it unfolding in the subsequent slides. The renoprotective effect of chronic kidney disease patients, 60 patients, small group studied in the open label RCT trial and we saw that the blood pressure not only was controlled in both the groups, but after 12 months, proteinuria and heart rate was significantly decreased in cilnidipine group, but proteinuria increased and the heart rate remained unchanged in the L-type calcium channel blockers, highlighting the effect of cilnidipine on the N-channel blockade and thereby casting an effect on reducing proteinuria. In diabetic nephropathy, this was a study, 38 outpatients, where urinary albumin index and blood pressure were studied and the comparison was done before and after substitution of amlodipine. We can see in the slide that HbA1c before and after, no major change. The BP effect also was nearly the same. What was highlighted over here is the urinary albumin index, which was far reduced when cilnidipine was combined with the ARBs or the ACE inhibitors thereby highlighting the effect of L and N channel dual-blockade of cilnidipine. No significant change in BP reduction. We mentioned the endpoint, so, the N-type calcium channel blockade result in a significant reduction of albuminuria suggesting renoprotective effect of cilnidipine. So, friends in summary, cilnidipine has the trump over the calcium channel blockers because of its effects on the N-channel blockage and thereby in addition, to not only controlling the blood pressure, it has a tremendous amount of renoprotective effect, thereby reducing the albuminuria or the progression of renal disease. Not only it does that, basically, the mechanism of N-channels is at the podocytes of the kidneys of the glomerular filtration apparatus is teaming with N-receptors and cilnidipine by its property of inhibiting the end channel receptors prevents the podocytic injury and thereby casting favorable effects on the kidneys and preventing kidney disease. So, this is one key in the block as far as calcium channel blockade is concerned. not only controlling the BP but also prevents, you know, progression of the kidney disease, which is a phenomenal impact in the treatment of hypertension. Thank you for you attention. Dr. Ajit Desai: Thank you Dr. Rajani for such a lucid presentation and I think you have nicely elaborated that we have one more drug which is on the horizon and which is likely to be used more frequently as a calcium channel blocker in the treatment of hypertension. I have a question to ask you, is there any contraindication or do you have to be a little on the guard when you use this particular drug in patients who have severe coronary artery disease presenting with very frequent angina? Dr. Rajesh Rajani: It is a marvelous question actually. I think, if we understand the whole history and mechanics of action of calcium channel blocker it basically inhibits the L-channels and that is why it causes vasodilatation. One has to be very careful because of coronary steal phenomenon, which can happen on the coronary vessels. So, I would be extremely. extremely vary in using this in patients with unstable angina, which may worsen and very cautious in patients overall with angina pectoris also where we got to be watchful, so a very very important question. Dr. Ajit Desai: So, in patients who have got very recent onset angina or who have very unstable angina, it is a drug, which should be used with caution. Dr. C.K. Ponde: Dr. Rajesh, in your lecture you have said very clearly that proteinuria is very significantly benefited with this drug as compared to the L-type of calcium channel blockers, and it is almost comparable to that achieved with ACE inhibitors and all that. Have you used this drug and have you really seen the effect on proteinuria as good or comparable or very robust effect of proteinuria with this drug in your clinical practice? Dr. Rajesh Rajani: It is another great question Dr. Shekar. I have used this drug but I have not gone in to study a huge cohort of patients. So, my answer to this question would be no, no I have not studied the effects of proteinuria and the limitation of proteinuria by its advantage of the N-channel blockage. But having said that, I think, one thing is certain that I would be extremely confident to use in patients with CKD effortlessly as compared to the L-channel blockers, which were there earlier available in the market as compared to cilnidipine. So, certainly, I would use it and studies in the offering, however in my clinical practice I have not studied the cohort, but certainly, I will be using in patients who have got proteinuria or diabetic neuropathy. Dr. Ajit Desai: Dr. Rajesh it is a wonderful presentation and as Dr. Ponde said that most of the time when we have patients who have got hypertension will have proteinuria, the ACE inhibitor and ARBs were thought to be the ones which are very useful, but now we have one more drug which can be an added advantage as far as patients with proteinuria are concerned. Dr. C.K. Ponde: Without the side effect of cough, so I think those who do not tolerate ACE inhibitors and ARBs because of hyperkalemia, rise in creatinine, or cough, I think this is one of the wonderful drugs to use. Dr. Rajesh Rajani: Absolutely, and especially the fact that it reduces the intraglomerular pressures by dilating the afferent and efferent together, balancing the whole thing, which only the L-channel does, just dilating the afferent arteriole. So, surely a promising drug in the offering. Dr. Ajit Desai: Thank you Dr. Rajani for a wonderful presentation. Dr. C.K. Ponde: My friends, now we come to the last part of this symposium on hypertension which is the combination therapy and hypertension - its rationale and the clinical evidence for the same. As we all know, the blood pressure targets for various conditions are different and Dr. Kane had already told you in his talk that for ordinary hypertension, uncomplicated hypertension, the target blood pressure is 140/90 and for complicated hypertension with chronic renal disease or coronary artery disease or type 2 diabetes this goal is further lower, which is 130/80 or below that. When you talk of one single drug, there are limitations of using monotherapy and the most important limitation is a single drug commonly reduces systolic blood pressure by an average about 10-12 mmHg and the diastolic by around 5-7 mmHg and this really may not be adequate to as many as 40% of the patients who present to us in stage 2 hypertension where the diastolics are above 100. Blood pressure control therefore with monotherapy is adequate only in approximately half of the patients. Secondly, to reach the target blood pressure or to achieve the blood pressure one may have to use the high dose of a single agent, which may cause unacceptable side effects. For example, if you have to use amlodipine in a dose of around 10 mg it will give peripheral edema. Cost of the high dose of single agent may also be prohibitive, and of course if you are using drugs like diuretics at highest possible dosages then derailment of metabolic parameters is always possible with new onset of diabetes, hyponatremia, and hypokalemia. Therefore, the combination therapy has been used in most of the clinical trials, which have taken place in the world until now. So, combining the effects of different classes of drugs has several advantages. The first common advantage is offsetting the side effect of one drug with another drug. For example, if you have a dihydropyridine calcium blocker, which produces tachycardia, you offset that or you negate that with the use of beta blocker. Use of calcium channel blockers, which cause fluid retention, then you use diuretics to offset that side effect of the calcium channel blockers. There is one common rationale. The second common rationale is hypertension population which is studied today in the world, almost 40% are categorized as stage 2 hypertension and where it is impossible to achieve the target blood pressure with the use of a single drug. The other rationale is blood pressure is sustained by multiple interrelated mechanisms, and I will show you in my next coming slides that what are these mechanisms. So, due to resetting of the set point when the blood pressure is lowered by blocking one pathway, the other pathway gets activated to compensate. Now these are the 3 groups of patients, I am always in love with this slide, it is very self-explanatory. Patient 1 is a typical patient in whom the renin-angiotensin system is hyperactive. Patient 2 is a patient who is volume-loaded patient, typical like pregnancy with hypertension, volume overloaded hypertension. Whereas patient 3 is a patient in whom the sympathetic activity is overactive. A typical young, anxious, over ambitious hypertensive patient who is a globetrotter and runs around in the day for 14 hours and these are typical patient with sympathetic overactivity. Now, what happens, let us say, you start treating the patient who is volume expanded, who has edema, a little bit obese set patient, a typical patient with metabolic syndrome belongs to this category and you start a diuretic. Diuretics contracts the plasma volume and contracts the extracellular volume, so you see the yellow square becoming smaller after a 6-week follow up and when the extracellular volume with the plasma volume gets contracted there occurs a secondary activation of the renin-angiotensin system and then the blood pressure starts creeping up again. What do you do then? Then you have to add an ARB or an ACE inhibitor to offset the effects of secondary activation of renin-angiotensin system and this happens all the time in hypertensive patients. So, combination therapy is a practical necessity let me tell you that. If you see the 3 big trials in hypertension; ALLHAT trial, HOT trial, and the LIFE trial, the percentage of patients treating to target by monotherapy are no more than max 30%. So, the aggregate available data suggest that at least 75% of patients require combination therapy to achieve blood pressure target. There is another study showing you all the trials from UKPDS, ABCD, HOT, AASK, ALLHAT, IDNT, and RENAAL, you see around 2-3 drugs on an average were used to reach the target blood pressure in majority of these trials. Meta-analysis of 42 randomize trials performed in approximately 11,000 patients have shown that the blood pressure loading efficacy of combining two different classes of drugs is approximately 5 times greater, not double, it is 5 times greater than doubling the dose of a single drug. It is very, very important concept. So, reduction in adverse event is also frequently observed by using combination of drug. So if you use 5 mg amlodipine and a small dose of chlorthalidone, possibly you will get much better blood pressure reduction and no peripheral edema comparing with increasing the amlodipine dose to 10 mg a day. So, combination therapy does not double the number of adverse events, it in fact improves the efficacy and the cost and improve even safety and reduction of side effects. So, in JNC-7 the key messages were most patients with hypertension will require 2 or more antihypertensive drugs and the blood pressure is 20 systolic and 10 diastolic above the target goal by using monotherapy, after using monotherapy you certainly, certainly require the second drug on the board. These are the JNC-7, European Society of Hypertension, and the NIC guidelines, which all will tell you that 2 drugs or perhaps even 3 drugs are required in almost 60%-70% of hypertensive population in the world today. So, the possible combinations are thiazide-type diuretic and ARBs, thiazide-type diuretics and calcium blockers, thiazide-type diuretics and ACE inhibitors. These are 3 commonest combinations, which are very very useful in the clinical practice. The other best combination is beta-blocker with a calcium blocker, which can produce reflex tachycardia, but Dr. Rajani has just told us that there is a new calcium blocker, cilnidipine, which does not cause as much reflex tachycardia as the old L-type calcium channel blocker used to cause. So, I think this combination will be a little redundant now with the use of cilnidipine, but the other combinations will still hold the fort. So, combining drugs with different mechanism has a physiological approach and the most commonly used combinations will be ACE with a thiazide-type diuretic, ARB with a thiazide-type diuretic, ARB with a calcium blocker, ACE with a calcium blocker, and lastly beta-blocker with a calcium-blocker. In some select group of patients who are really resistant, stubborn hypertensives, a triple combination may be needed, and when 3 drugs are required the most rationale combination appears to be a renin-angiotensin blocker either an ACE or an ARB, a calcium antagonist, and a diuretic. So, this is a triple drug combination, which is the most useful combination in one of those resistant small subgroup of patients with hypertension. The potential disadvantages also are there in using combination. 2. In elderly when you are using a combination you should be very, very careful because elderly are prone to orthostatic hypotension and drugs used in combination, particularly calcium channel blocker with a diuretic or an ARB with a diuretic, you are exposing the patient to the risk of orthostatic hypotension. 3. The risk of drug-drug interaction also remains. 4. Of course, the need for very fine technology to combine multiple drugs in one capsule or a tablet, so these are potential disadvantages. But a paper recently from Jordan et al has shown that you need not really use the maximum tolerable dosages of drugs in combinations. You can use maybe 5 amlodipine with 6.25 chlorthalidone or 40-80 mg of telmisartan with a small dose of chlorthalidone or 40 mg of telmisartan with 2.5 mg of amlodipine and also 40 mg telmisartan with a small dose of metoprolol 25 to 50 mg. So, half the maximum tolerable dosages of drugs when they are combined, they can cause equivalent BP reduction with much lesser side effects, so this is a very useful paper which will tell you that analysis of 354 randomized trials was done and it has shown that half the standard dosage when they are combined you land up in almost equal efficacy at much, much, much lower side effect profile of these drugs. So, in nutshell, the advantages of combination therapy are the patient lands up in taking fewer pills of course, it improves compliance of the patient, it increases efficacy of the drugs, you take shorter time to achieve the target blood pressure, you get effective BP control, they give additive action and at the cost of very low side effects of individual drugs. So, this is the advantage of using a combination therapy. Dr. Ajit Desai: Well friends as you have seen today we had a very precise and a nice presentation, which was done by various speakers and it gave an overall view of what are the problems related to hypertension and how you should tackle them in your clinical practice. Well, I would like to take this opportunity to thank Dr. Ponde who has been behind this particular symposium for organizing and taking all the efforts to see that it has been a great success, thank you, Dr. Ponde. I would also like to thank each of the speakers starting with Dr. Vivek Mehan who has done a wonderful job, Dr. Kane who as usual has presented it so beautifully and conveyed the message, Dr. Chetan Shah as usual very fluent with his presentation and conveying the message, and lastly Dr. Rajani who as usual has been today's star for the presentations. By Dr. Rajiv Karnik , Dr. Bhaskar Shah , Dr. Uday Jadhav , Dr. Sadaanand Shetty and Dr. Ajay Mahajan. By Prof. Dr. M.S. Amaresan.